My ventures into sewing my own clothes and generally making and recycling stuff. Mad men time! 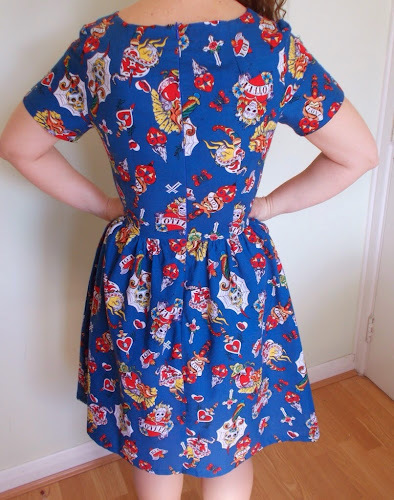 My peggy dress is complete. 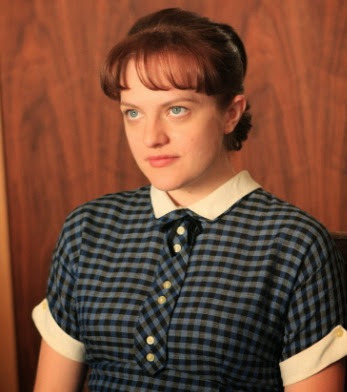 My inspiration is taken from Peggy's appearance in episode 2 of series 2. 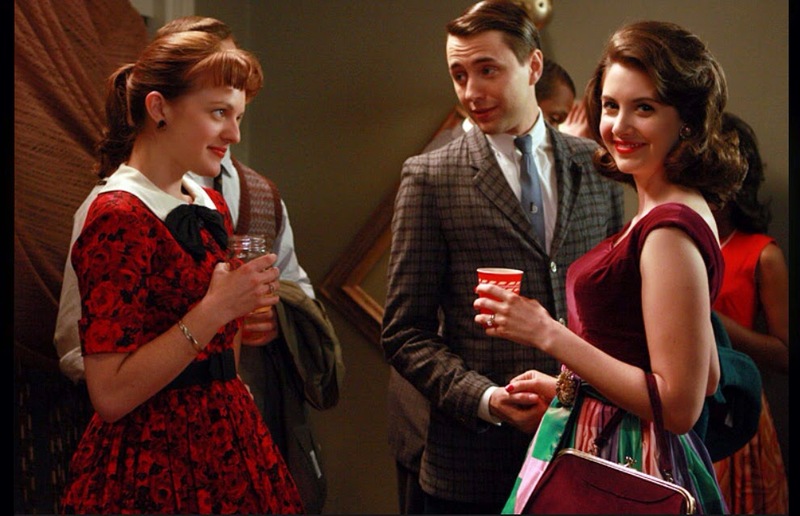 Peggy is at a party and getting pretty friendly with a man called Eugene. He asks Peggy to go back to his place to which she replies 'I'm in the persuasion business, and frankly I'm disappointed with your presentation'. She then walks out. Pretty impressive eh? I'd picked the fabric, the pattern and everything. Then I saw this dress and my plans went out of the window! I set on a mission to find the floral fabric. Let's say it took a little bit longer than I expected!! I daren't say how long. Fortunately I found what I was looking for in a UK online shop called 'always knitting and sewing'. 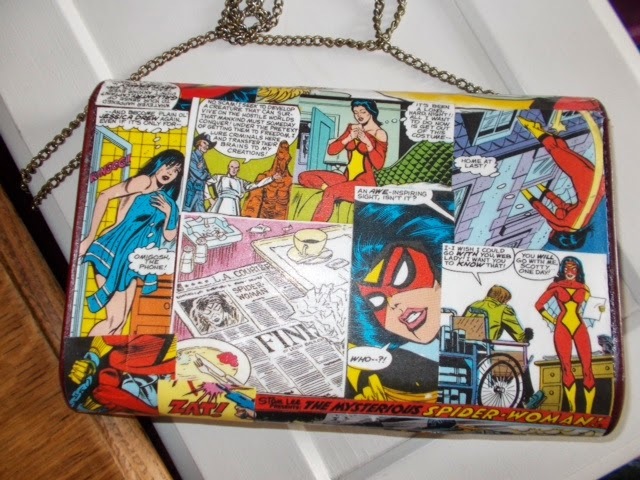 It's a great shop and offers fast and cheap postage. Not a perfect match but not bad. The pattern I used was my new favourite the Christine Haynes 'Emery'. It's only the second dress pattern I own (after the By Hand London Anna) so not exactly spoilt for choice! I reckon its a pretty good pattern for this style of dress. I was nervous about using a vintage pattern as they have a reputation for being brief with instructions! The only changes I made (that haven't already been mentioned in the Sew Dolly Clackett dress) were to lengthen the sleeves and skirt and make the collar removeable. The bow I just made up myself. Both are just tacked on. I'm going to remove them both so I can wear the dress in real life. As I new to dressmaking I can't face making something I'll never wear! 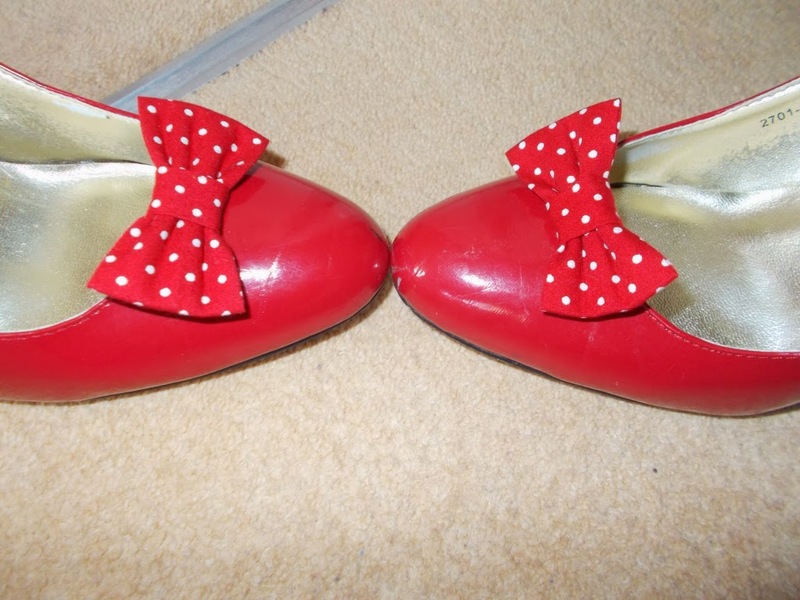 I'm pretty happy with the end result and can see myself wearing it lots - minus the bow and collar. 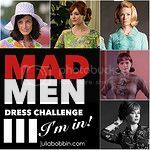 Should there be another mad men challenge I'm going to be more adventurous! Many thanks to Julia for hosting the challenge. It's loud and it's proud! 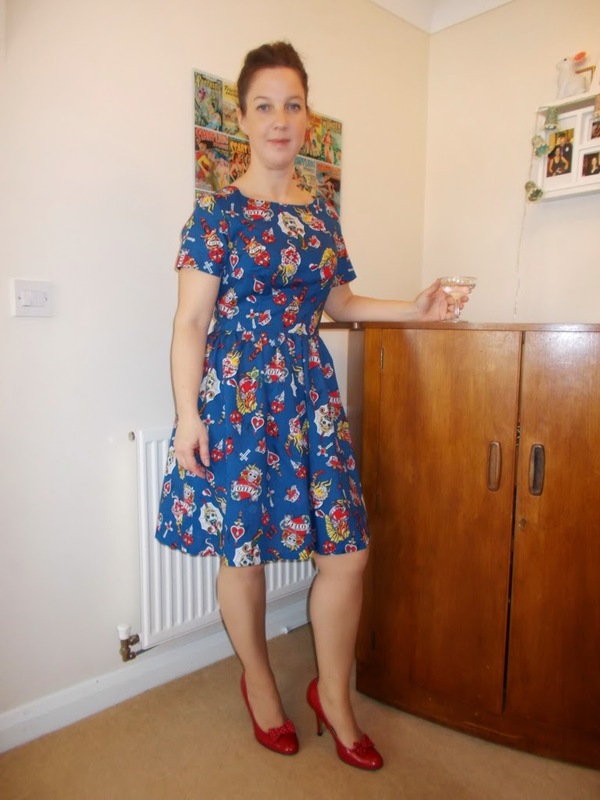 It's my finished Sew Dolly Clackett dress aka the 'hearts and daggers' dress. 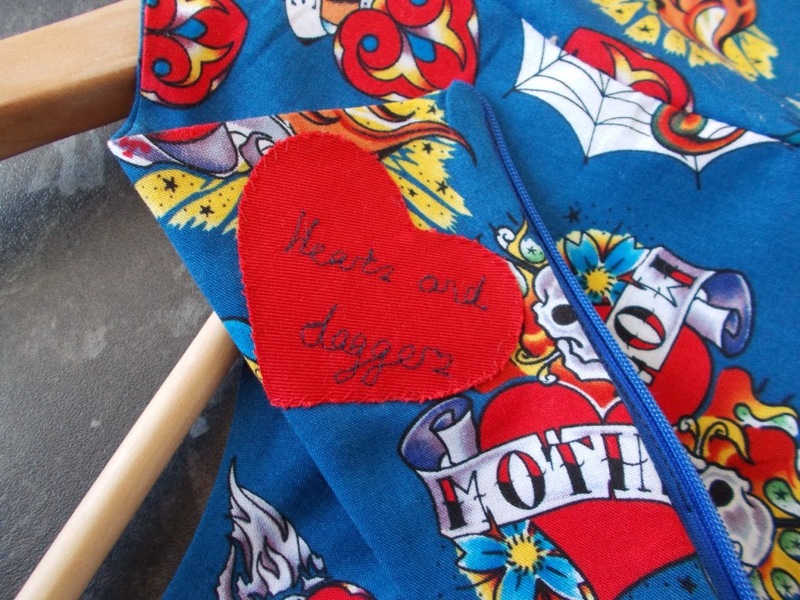 The fabric is called 'blue mother tattoo' and I bought it from Ditto fabrics ages ago. I love this fabric and I picked it because I have a slight obsession with skulls (I liked them before they can back into fashion honest!). When the fabric arrived I was overcome with fear of making anything with it and its sat in my fabric stash for months. Fortunately this sewing challenge came along and I knew I had to use it. The pattern is Emery by Christine Haynes. 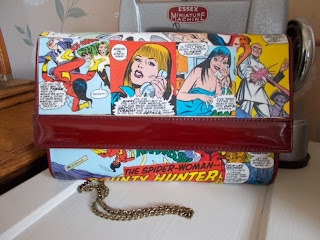 This seems to be a favourite with sewing bloggers at the mo. 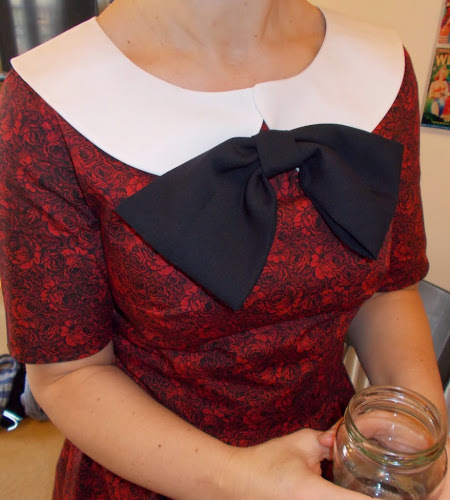 My only other experience of making a dress was using the By Hand London Anna dress - a beginner pattern. I was concerned that the Emery might be beyond me but I actually managed ok. I thought the instructions were really good. I did make a muslin of the bodice and had to make some alterations to the size 12 that I cut. These were; lengthening the bodice by 1.5cm, making the neck darts bigger, taking 1.5cm out of each side of the back bodice pieces, raising the bust darts by 1cm, and shortening the skirt a fair amount (I have stumpy legs). I did leave out doing the pockets (I'll only end up putting tissues in them and then putting the dress in the wash)! I didn't go for the collar as i reckoned it would be a bit OTT. I've made it very fitted but it's still comfortable. I'm not sure a baggy bodice with a full skirt would be a good look! The final touch- a little freemotion embroidered label! Cheers Nic & Roisin on your wedding! 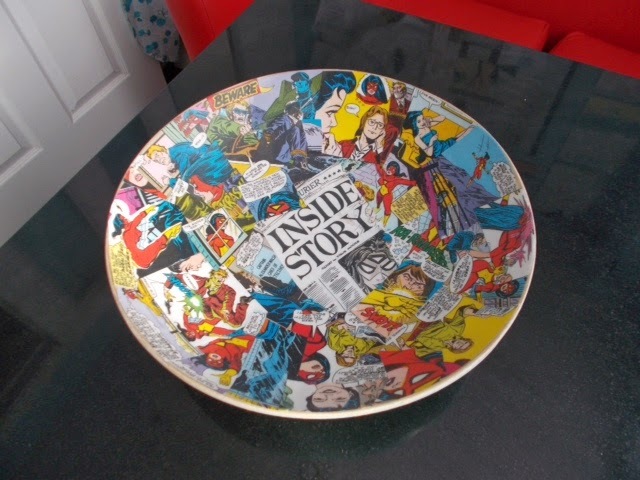 There are loads of mod podge projects on the web and its difficult not to be inspired. My bag and bowl were both made for a few pounds each and didn't take much time at all. Decoupage - the ancient art of sticking! What's not to love with messing about with bits of paper (or fabric) and glue? It takes me back to my school days and the fun we all had peeling PVA glue from our hands. 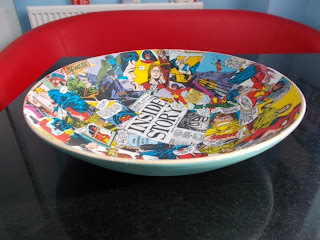 Anyway I was inspired by the fabulous things on the Bombus site and in particular this bowl. Isn't it amazing? Unfortunately I didn't have the £145 needed to buy it but I did have some old annuals in the loft and a bamboo bowl from Ikea. Add in some mod podge and I was ready to go! 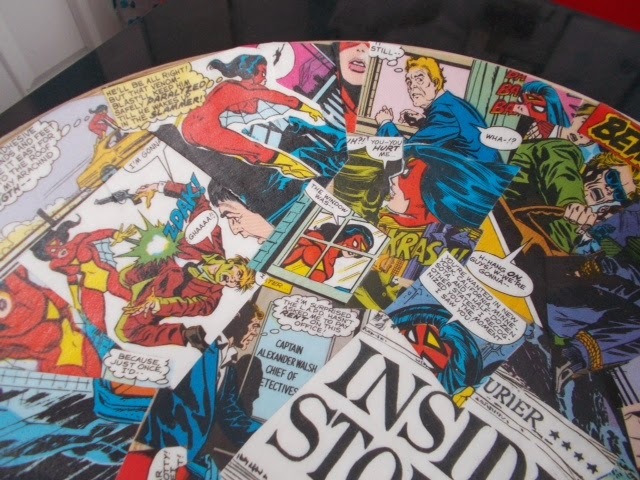 It's quite hard wearing as it lives on the coffee table and all sorts of bits of pieces get thrown into it! 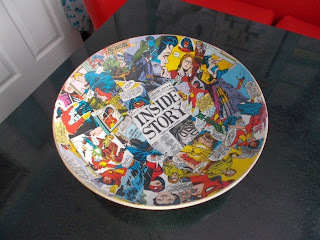 Total cost approx a fiver - bargain!! Taking on a sewing challenge or two! Well, I think I might be a bit crazy but I've signed myself up for not one but two sewing challenges! 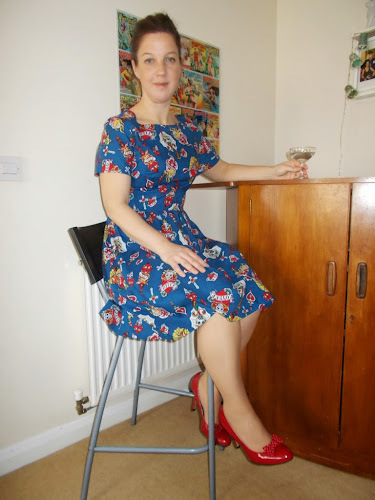 I first saw the Mad Men dress challenge over on Julia Bobbins blog - http://www.juliabobbin.com/ a few months back and when this year's challenge came up I knew I had to go for it. Some the previous entries are pretty impressive so I'm thinking up ideas and checking out fabric. I might do something in Peggy's style but I just can't make up my mind. No sooner than I signed myself up for the Mad Men challenge another one came my way courtesy of the Dolly Clackett blog - http://dollyclackett.blogspot.co.uk/ Roisins lovely friend Sarah, of Rhinestones and Telephones, has set up the 'Sew Dolly Clackett' challenge in celebration of Roisins marriage to her fiance Nic in May. Its a fabulous idea and I really felt I should join in as I've been so inspired to start sewing clothes because of Roisins blog. I do already have the perfect 'dolly esque' fabric which I've been avoiding sewing into anything as its a bit in yer face. I might post a sneak peak of the fabric soon! 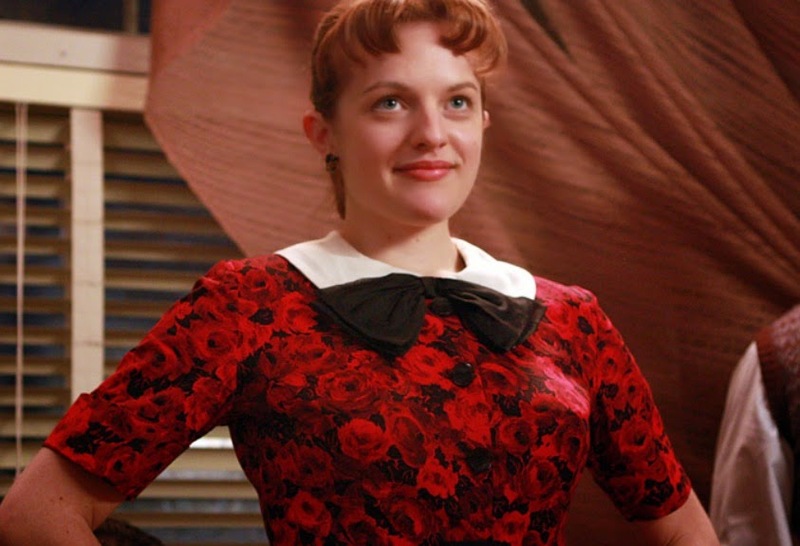 I've got the Anna and Emery dress patterns so I'm deciding between the two or may do a mash up of the patterns. I realise I need to actually get on and make at least one of the dresses ASAP as the clock is ticking! You can tell by my expression (not) that I love this dress! 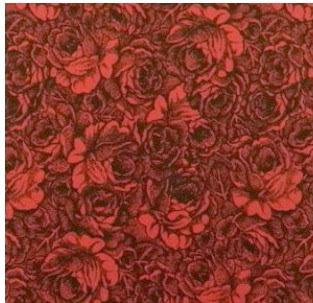 The fabric a matt stretch satin by John Kaldor. I found a remnant in a fabric shop in Leeds for £6. It's a fantastic fabric to sew and very comfortable to wear, especially if you're having a big meal! I can even get the dress on without using the zip. Shame I didn't work that out before inserting the zip though! I've worn this dress to two parties and it makes me feel great. I've since gone on the make a fourth Anna, this time with sleeves following the By Hand London Anna sewalong. I used a terrible fabric though which was a pain in the arse to sew with. I like the sleeves but probably prefer the sleeveless version. I'd say its worth the time making sure the fit is good. It did take me a while to work out how to alter the pattern but now I know I can use it again and again and (hopefully)get a good result! The pattern has given me the confidence to think 'yeah I can make clothes that I actually like and actually fit me' and I'm well on my way to making my handmade wardrobe. This blogging lark is all a bit scary but here it goes! I've just started making clothes after many years of sticking to the 'safe' sewing options of cushions, curtains and bags. 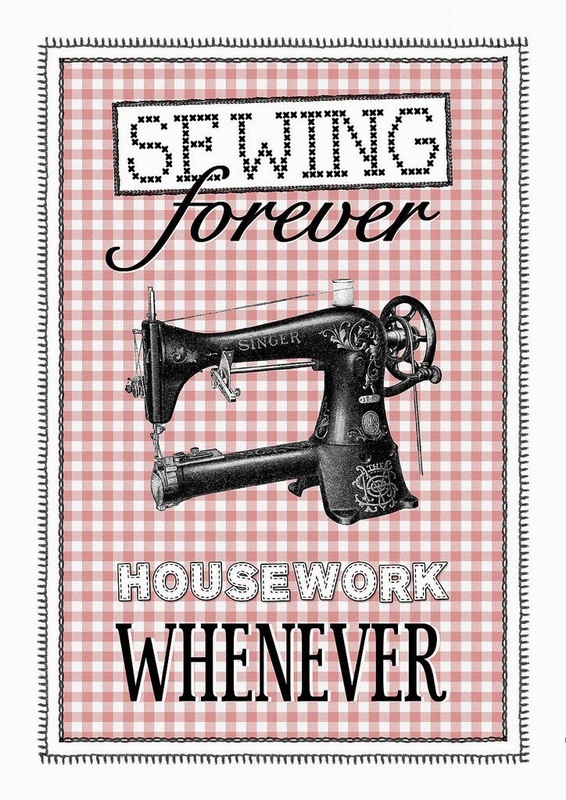 I'd always thought sewing clothes was a bit beyond me, and that I'd never get the hang of it and be wasting my time. However thanks to the wonders of the web I've slowly been learning new techniques and have actually made some wearable items! Ok, so they may not be perfect but I'm pretty happy anyway. I also like to dabble in other crafts and like to recycle things if I can. According to my sister I need to 'get out more' but most of the time I'm happy at home making stuff.